Our medical elective placements in Mexico are based in the cosmopolitan city of Guadalajara and picturesque coastal town or Puerto Vallarta. Guadalajara is Mexico’s second largest city so placements here are diverse and challenging. Puerto Vallarta is a tourist town on the Pacific Coast, so electives here are ideal for you if you’re interested in a more relaxed pace and being close to the beach! We work with a number of partner hospitals, ranging from large multi-disciplinary hospitals to small specialist clinics. You will initially be placed in a general hospital and specialist emergency clinic. These are the placements where more of the staff speak and understand English and provide an excellent induction. If you already have conversational Spanish or once your Spanish has improved, we can then arrange a bespoke placement to suit your objectives, as few medics in other specialties will speak English. With a population of 10 million people, Guadalajara has a host of regional referral hospitals so nearly all specialties can be catered for. Most of the hospitals we work with are funded by the Mexican Red Cross or the local government. Medical provision in Mexico is not free. These hospitals provide low cost medical services to those who are unable to afford expensive insurance and so they are always grateful for any help and additional resources that you can bring. This means that an elective in Mexico is more of a pure volunteer experience where you can play an active role, put your skills to use and help to make a difference, rather than just observe. 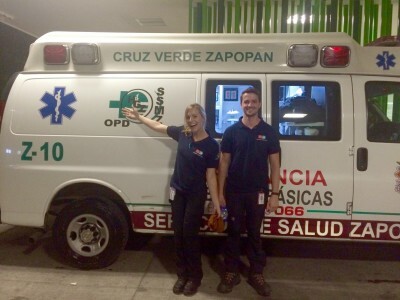 The electives in Mexico are particularly good if you’re interested in emergency medicine or pre-hospital care. As a medical student you are welcome to join our paramedic program and can spend all of your elective based with the emergency paramedics or you can elect to combine your time on a traditional hospital based medical elective with a time on the ambulances. Combining your elective with time on the ambulances is only an additional £100 / AUS$200 / US$160 /120€. Although all our projects in Mexico include a basic Spanish course in your first week, it is useful if you have at least some basic Spanish before joining the medical project in Mexico. If you have no Spanish or are not confident that your Spanish is quite up to scratch we would recommend starting your elective in Puerto Vallarta where more staff and patients speak English. Alternatively, we are happy to recommend a good one week Spanish course. Many on our medical projects spend time helping in orphanages or schools in the afternoons. This is a great way to give something back to the community that is teaching you so much. There are a number of larger hospitals and regional referral centers in Guadalajara. Guadalajara is the state capital of Jalisco and as such most complicated or serious cases from the outlying towns and districts are referred to hospitals in Guadalajara which means that we can arrange a bespoke elective to suit nearly all objectives. Contact us to discuss your objectives. Our most popular placements are the general hospital and specialist emergency clinic in the district of Zapopan. Both are funded by the government and people present to these hospitals and clinics if they can’t afford health insurance and treatment in more expensive private hospitals. Typical shifts here are two 6 hour day shifts (early and late) and a 12 hour night shift. You can choose your shift patterns, most electing to work the busier later day shift and weekends with a couple of days off during the week for travelling. The placements in Puerto Vallarta are slightly different to those in Guadalajara. Puerto Vallarta is a tourist area famed for it’s great beaches, vibrant culture, and delicious cuisine. As such, the hospitals here cater not only for the local population but also for tourists, the expatriate community and also medical tourists. Our placement is at the main government hospital in Puerto Vallarta. The facility includes four intensive care beds, three operating rooms, pre-op and post-recovery rooms and rooms for overnight stays. The hospital’s medical facilities are the first to offer health services 24 hours a day, seven days a week to the people of Puerto Vallarta, and the only specialised Radiology clinic in Western Mexico. The medical elective projects can be combined with any other medical projects, our orphanage project, or our turtle conservation project.